Unfortunately the Horror-Fairy wasn’t listening when I sought guidance for this one, and innumerable times over the previous 10 years. I read somewhere that Darkness Falls was one of the scariest movies ever, now I saw it shortly after it arrived on DVD which must have only been 2004 here, and I had already forgotten almost everything about this film. I’ve been wrong about movies before (not too often I must say), so I thought it was my duty to check it out again. For what it’s worth, here is the basic story: A long time ago Matilda Dixon was known as the Tooth Fairy in the local community, for her friendliness to children. Unfortunately after a misunderstanding the townspeople done did her wrong, and she died in less than ideal circumstances, (She was fried). 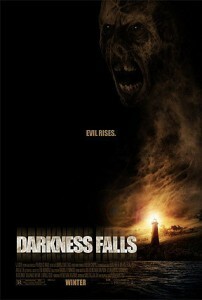 Oh yeah, the town is called Darkness Falls. As you would expect she was pretty pissed with events as they transpired, being burnt alive and all. As you may not expect (unless you’ve seen a horror film before), she decided to come back to the town for a visit, and she now kills anyone that sees her. We are told this by a very earnest narrator in a very serious sounding voiceover. I was already thinking “So far, So hokey.” The remainder of the movie turns to present day, but raises more questions than it answers. We move to a young boy’s bedroom, he is say 13 years old and is hitting the sack. He has lost his last baby tooth that day, as he prepares to jump into bed a shadowy figure flashes past his window left to right, when he goes closer to investigate it turns out that the flash was his sorta girlfriend. Question 1/ The bedroom is on the first floor, how does she flash from left to right across the window? The young boy is Kyle, his girl-buddy is Kat, and in around two minutes they have their first kiss and set-up their first date, and Kat then leaves. Nothing. I tell you NOTHING moved that fast when I was in my teens, (or my twenties for that matter). Shortly afterwards, Kyle hits the hay and almost immediately, enter stage left, is the Tooth Fairy, who I am sorry to say has a severe breathing problem. I can only surmise that the Tooth Fairy is hanging out with the chick from The Grudge, cause she gurgles and sputters through the whole pic. The scene has one really good jump scare, cheap but good. Kyle understandably cries out for Mummy, who also understandably comes running. Mummy cops it. Kyle is accused as he is the only survivor in the house, he is taken into care and ends up spending years with the psychiatrist. Kyle and Kat is all growed up. Kat’s little bro Michael sadly enough now has night terrors and it turns out that Kyle never got over his teen experience, which shouldn’t be that amazing if you think about it. Kat approaches Kyle to see if what he went through might give her a clue how to handle Michael’s situation. Kyle gives it a shot, but once it is evident that Michael is going through the real deal he backs away. I don’t really have a point here, but Michael must be about 10 or 11, and “he tawks wike an absowute baby”. Surely a speech counselor or perhaps his parents might have tried to rectify his speech impediment? Moving on, once Kyle leaves the hospital people start dying around him, again as a previous suspected offender he is under the microscope. Meanwhile at the hospital the doctor’s have decided that reverse psychology is the go, and will put Michael through tests that involve him immersing him in total darkness. It is about this time that it becomes clear that The Tooth Fairy (TF from here) can only operate in total darkness, and light is her only enemy, so from here on in we have another “lights go off randomly” film. Again like The Grudge, we have a situation where the baddie manages to appear wherever the principal actor is, even after they drive for an hour, and it is evident that the TF is targeting Kyle and Michael almost exclusively, every kill in the film though occurs with those that are fraternizing with either one of them. Question 3/ What has Kyle been doing for 12 years if the TF has been gunning for him the whole time? Has he bought a lifetime pass at a tanning salon? What follows from here causes Kyle to stop by at a police station and a hospital where at both locations the lighting is cut off. Again the TF is hot on his tail and picking off anyone who sees her (and plenty who don’t for that matter), despite Kyle repeatedly warning them of exactly what not to do. Question 4/ If the Tooth Fairy only kills those that see her, why not sit in the corner with your eyes shut until she leaves on Kyle’s trail? Question 5/ Why does neither the Police Station, or especially the Hospital, have better back up power? The lesson should have been OK don’t use the exact same plot device to try to build tension. If the guy who made Darkness Falls saw Titanic he didn’t get the same message. We finally see the Tooth Fairy and she is fierce and grotesque enough, but by this stage I didn’t care. Those who were scared by the concept of the Tooth Fairy in the first place, probably don’t have the disposition required to watch a pretty formulaic horror movie anyway. For some reason I repeatedly thought that the music playing in Darkness Falls was strongly reminiscent of the music of “Saving Private Ryan”. I don’t think this means anything, but I was reminded frequently nonetheless. Before I considered my Final Rating, I thought of the last couple of horror movies I watched this week, Jeepers Creepers 2 and Below, I decided I liked this marginally more than JC2 because at least the creators of Darkness Falls put some effort into trying to scare the audience, even if it wasn’t too effective in the main, I just think JC2 thought the Creeper would do the work for them. Final Rating – 5.5 / 10. This is the second “Uh-oh. Lights went off again” movie in a week. I know which I prefer. File under “possibly scary for teens”. This entry was posted in Crappy Movies, Film, Movie Reviews. Bookmark the permalink.